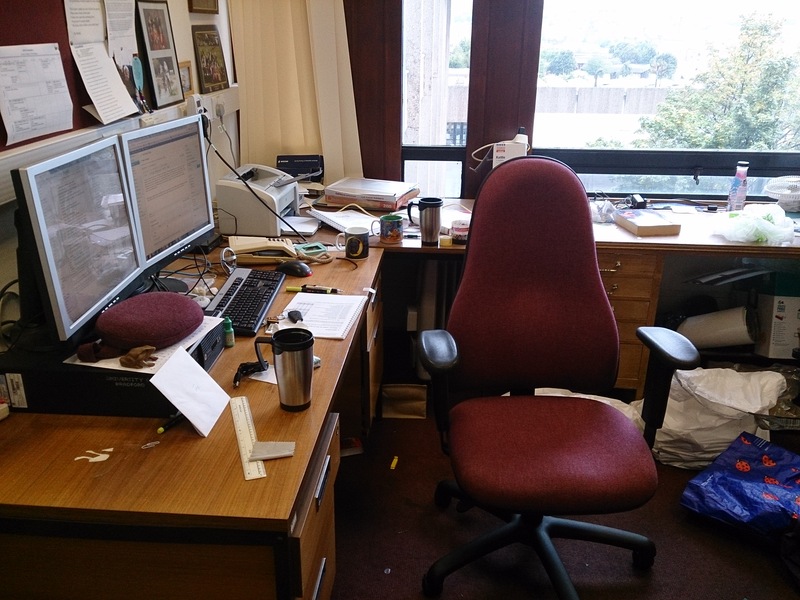 I am sat in a fairly tidy office (which is unheard for me!!!!) about to shut the computer down. It may not be truly turned on again for 41 weeks – which after 14 years in the same workplace and 10 years in the same office is a bizarre feeling. I am about to enter a whole new phase of my life – yes meeting and marrying T in 11 months was strange but in some ways this feels bigger. For 14 years I have been coming here most week days to work, to deal with students and to be part of a community. Now I leave for a while and have to wait to see what I come back to given the changes that are happening within my part of the university. Ok knowing me I shall be back in from time to time – given preparatory research stuff (for when I return in late July) and at least 1 PhD viva I have to be in at times. But no longer for the next 9 1/2 months will I be coming here 4/5 days a week for 8-10 hrs a day. Not sure why it is hitting me so hard but probably because I have basically spent my entire working career here and I have a lot of friends who I am going to miss. But I also have a new phase of my life that is going to change it beyond belief and probably turn it upside down. One I am looking forward to so much – even if there is a mixture of nerves as well as excitement there. Hope all goes well, all the best! !